Luxurious & Tasteful Oceanfront Condo! An in-depth, spare-no-expense renovation of this property has recently been completed. The result: a true Work of Art! Indulge yourself in a direct oceanfront atmosphere replete with refinement and luxury. Enjoy porcelain ceramic tile floors, granite countertops, custom-built lighted cabinets, a spiral staircase ascending to the Master Bedroom Loft Suite, brushed glass Shoji closet doors with automatic lighting, antique Oriental bathroom cabinets with vessel sinks, all-new high end furnishings, and a tasteful decor sprinkled with Far Eastern accessories. This condominium features a premium California king-sized bed in the Master Bedroom Loft Suite, and the Second Bedroom has a queen-sized bed. Both bedrooms adjoin private, full bathrooms with stone & travertine showers, vessel sinks, and antique Oriental cabinets. There is also a powder room adjacent to the Second Bathroom that is accessible to the Kitchen/Living Area. The condominium sleeps a maximum of four guests. 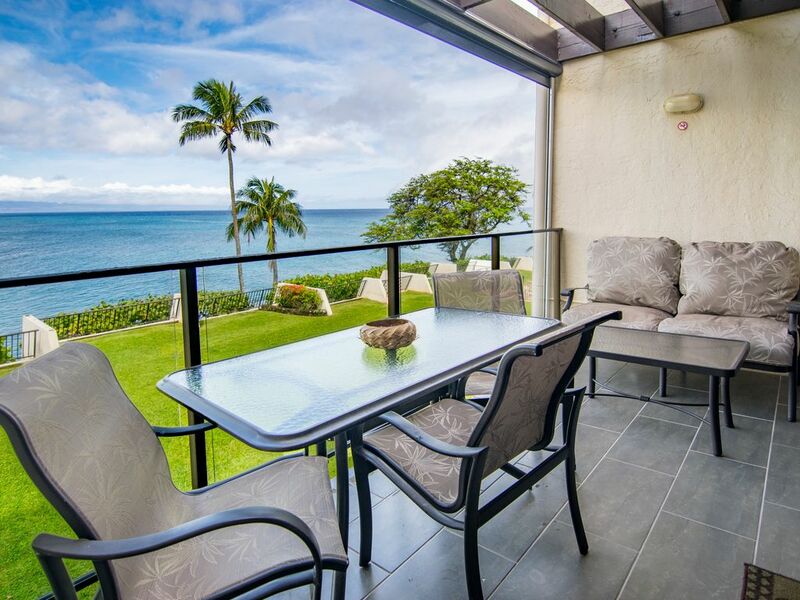 This 1,018-square-foot, second floor, two-bedroom, two-and-a-half-bathroom condominium is located on prime oceanfront real estate in the Napili Point Resort at Napili, West Maui. A single flight of stairs provides access to the resort's second level, where direct ocean views of Honokeana Bay as well as the Maui/Lanai/Molokai channel distract guests with their incredible beauty. Conveniently located to all of the Kapalua Resort restaurants, including Merriman's, Pineapple Grill, and The Plantation House, this condominium also offers an amazing kitchen for cooking gourmet meals and dining in. Enjoy world-class golf at Kapalua's Bay and Plantation Courses and experience the exciting sport offered by Kapalua's Adventure Center: hiking the groomed trails of the former Village Course or zip-lining down Maui's volcanic mountains. Swim with the sea turtles right in front of the condo in Honokeana Bay or walk less than five minutes to gorgeous white-sand Napili Bay Beach. Three other awesome beaches are within only a two-minute drive! Free Wifi is also included. This property addresses all of your needs; more, it addresses all of your desires. Come and experience for yourselves what luxury and excitement are all about! Note that onsite parking is available at no charge; however, a parking placard must be obtained at the onsite office. Private Washer/Dryer is situated inside the condo for the convenience of our guests. Private WiFi offered FREE of charge! Granite countertops, custom cabinets, and premium appliances are included in the full kitchen. This property's HDTVs are connected to cable service. Two on-site swimming pools for guests' use, one of which is only a few steps from the condo! Amazing condo with incredible views! I rented this condo for 8 nights in January 2019. I brought my best friend and my two sisters so we were a group of 4 adult women. We all loved this condo. The size was perfect having two full bedrooms and two full bathrooms. The kitchen is spacious enough and laid out well so it's easy for everyone to help make food, clean up, or do dishes all at the same time. Yes, the spiral stairs are a tad difficult to get large suitcases up and down but not as difficult as another review made it out to be. The beds were very comfortable and all the open windows kept cool ocean breezes flowing all the time. We enjoyed having the sliding glass door wide open the entire time we were there so we could listen to the waves or watch whales and surfers whether we were on the lanai or further inside the condo. We saw lots and lots of whales while sitting on the lanai so bring your good binoculars if you rent during whale season. We also saw lots of sea turtles right in front of the lanai in the bay as well. We did snorkel in the bay and had a really close encounter with a turtle that surfaced right in between 3 of us. The bay is very precarious to get in and out of though so we weren't comfortable going there more than once. We enjoyed snorkeling at Kapalua Beach which you can either walk to or drive to. The Kapalua Coastal trail was really beautiful and enjoyable and we walked to the entrance from the condo. We also loved whale watching with Pacific Whale Foundation and we loved our outrigger canoe excursion with Ali'i Maui Outrigger Canoes, all amazing and highly recommended. If you are comfortable with a semi-difficult hike, go to Twin Falls, follow the path past the second gate with the warning sign, all the way to the end and swim behind the waterfall, so fun! I hope to come back and rent this condo again someday. Mahalo! We loved this place. We are a family of 4 with 2 teenage boys. The condo has 2 beds, so the boys shared a bed. Not a big deal. It was wonderful watching the ocean from the balcony; the sunrises were amazing. The beach gear was a plus. Great access to sandy beaches within walking distance, including Napili beach less than 3 minute walk. Napili beach has sandy beaches, a great location for body surfing or hanging out in the waves. If you'd rather snorkel, the cove right outside the condo is perfect. We lost count of the number of turtles we swam with during our stay. It was a perfect family Christmas vacation. Great property, views, but unit just ok. But the part that really bothered us was the insects... Ants are everywhere and it's obvious that they are a constant problem based on the number of pesticides in the unit under the sink. We could live with the ants because it is Hawaii but then we saw roaches from under the oven. Roaches, really? All of this didn't ruin our vacation and we had a wonderful time, and the unit is nice if you can get past all of this. - but for the money I paid for 9 days, it definitely bothers me. Beautiful view, excellent island location, and very nicely appointed! This condo is really nice and I will definitely be back. First, this part of the island is wonderful for a more down to earth experience with Napili Bay and Kapalua Bay for swimming and snorkeling, and the added benefit of being less than a 1/2-mile from fine dining (Merrimen's) and a mile from the Ritz Carlton. We enjoyed every minute at the condo, including the complex (nice pools and BBQs, and friendly low key people). But mostly, the serenity of sitting on the lanai in the morning, as the sun set, and in the evening was perfection. The lanai is not that big, but you cannot beat the view. If Tropical Storm Olivia had not impacted the bay below the unit (aka Hono Bay), our time would have included swimming with turtles every day. But, we could see the countless turtles from our lanai anyhow, so it eased our suffering (lol). On the unit itself, the beds were really comfortable as was the couch and outdoor furniture. Space is big enough for 4 people, but not beyond that (in my opinion). TV's were hard to navigate, and the instructions were sparse, so if you plan on watching TV while there, you will want to make sure the owner/prop manager gets you instructions. When we could not find a cleaner in the unit that was safe for the granite countertops our on-island contact showed up with a full bottle within a few hours. And he was very generous at answering questions about boating activities (stayed for 30 minutes). Other benefits are that it's a side and top unit, so you only have neighbors on one side. The high ceiling also made all the difference. High ceilings just do something that relaxes you. Enjoy! We really enjoyed our stay in C16. It is beautifully decorated, just as the pictures show. The condo had everything we needed during our stay and was very comfortable. My only complaint was a lack of storage in the kitchen for dry foods. Several of the cabinets are locked, so all our groceries were on the counter, a small cabinet or hutch would be nice to store groceries. Kitchen is beautiful, groceries not so much. Condo was a short walk to Napili Beach but the snorkeling out in front of the condo is fantastic! We saw so many turtles we started counting them, 22 was our highest count. Relaxing on the lanai you could see turtles swimming. Sunsets were lovely from the lanai with view of Lanai and Moloka’i. We had two other families staying in Napili Point and our condo was nicer and had better views. Would definitely recommend C16! We stayed in this unit in August and it was wonderful. The condo was perfect for our family of four. It's in a great location and has great amenities. The sunshade and the open floor plan kept it cool all day. We had an issue with the washer but the property manager got back to me right away and sent someone to fix it within a couple of hours. We look forward to staying again on our next trip to Maui! Whale watch from your own private lanai, snorkel and scuba dive Maui's pristine coral reefs, golf at world-renowned Kapalua Resort (home of the PGA Tournament of Champions), dine beachfront at local restaurants, watch spinner dolphins frolic along the coastline, swim with the sea turtles right in front of your condo in Honokeana Bay, swim at the sandy crescent of Napili Bay Beach.